The Department of English at the University of New Hampshire offers a well-established Ph.D. program in English with a specialization in Composition Studies. Created in 1985, our program is designed to prepare experts in composition theory, research and pedagogy who can contribute to the evolving knowledge in the field through rigorous research and scholarship. In addition to a specialization in composition studies, students will develop a secondary area of specialization such as applied linguistics, critical theory, English as a second language, English teaching, linguistics or literature. One of the major strengths of the program is the opportunity to work closely with nationally-known faculty in composition studies in developing research and teaching expertise. We hold high expectations for students but work to create a supportive atmosphere where exams and coursework are matched to individual needs and interests. Ph.D. students in English normally hold graduate assistantships with the teaching load of one course per semester. Teaching opportunities include First-Year Writing, ESL Composition, Creative Nonfiction, Technical Writing, and Persuasive Writing, as well as Critical Analysis and Literature Courses. Some students also work in Robert J. Connors Writing Center and the Writing Across the Curriculum program. See the page on Financial Aid for more information. 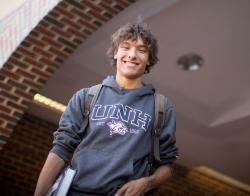 If you would like more information about tuition, fees, housing, and graduate life at UNH,visit the UNH Graduate School. a two-hour oral exam to be scheduled not more than one week after the written exams. The General section and Qualifying sections of the exam must be taken within a single week; the Qualifying Exam must be taken on two consecutive days. One 24 hour period will be devoted to the primary area of concentration (Composition Studies) and the second 24 hour period to the secondary area of specialization. Students will be awarded a grade of pass, pass with distinction, pass with reservation, or fail. Two failures will constitute grounds for dismissal from the program. Students who have failed the exams on the first try must retake them by the beginning of their fourth year of study. The General Examination will consist of interpretive responses to passages drawn from significant work in the field of composition studies. In the answers students are expected to show the relationship of each passage to the work of the author and to issues in the field. In preparing for the Qualifying Exam, the student will choose one secondary field of specialization in addition to the primary area of specialization in Composition Studies. Secondary fields might include a broad area of literary study, an equally broad area of linguistics, or literacy studies. Areas of specialization in literature are broad fields such as a genre, a literary or historical period, a major tradition, or criticism and theory. Areas of specialization in linguistics include theoretical linguistics, sociolinguistics, applied linguistics, and the like. Exam committees will consist of four faculty members, two in the area of composition and rhetoric, and two in the student's secondary field of specialization. The committee will be selected as follows. The Graduate Director, in consultation with the student, will choose a chair for the committee. The committee chair and the Graduate Director, again in consultation with the student, will choose three additional members in the student's fields of specialization. 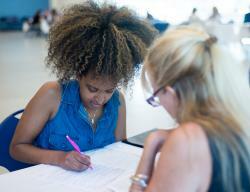 Students are encouraged to begin shaping their exam areas during the second year of study. They should begin to consult with the Graduate Director about their committee by the end of the second year. Students will prepare reading lists, which must be placed on file in the Graduate Office by the time of the exam. What is the purpose of the Ph.D. program in Composition Studies? Our Ph.D. Program in Composition Studies is designed to prepare experts in composition theory, research and administration. Ph.D.s in Composition Studies usually seek tenure-track positions in higher education, where they will engage in research and scholarship on writing, administer composition programs, prepare composition teachers, and teach composition courses as well as graduate courses in composition history, theory, research and pedagogy. Does UNH also offer an M.A. program in Composition Studies? 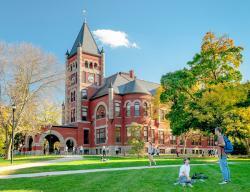 No, UNH offers Composition Studies at the Ph.D. level only. UNH does offer an MFA program in Creative Writing for those who want to become writers of fiction, nonfiction and poetry. Ph.D. in Composition Studies is for those who want to develop expertise in writing theory, research and administration. Do I need a master's degree in Composition Studies to apply to the Ph.D. program in Composition Studies? A master's degree in a related academic field is required. Although an applicant does not have to have an MA in Composition Studies, some graduate-level coursework in composition theory or research will be advantageous in gaining admission. If you have little or no background in Composition Studies, you will be expected to "catch up" during the first two years while completing your coursework. We expect all incoming Ph.D. students to be familiar with articles included in Cross-Talk in Comp Theory 2nd ed., edited by Victor Villanueva. Will the Ph.D. program in Composition Studies help me develop my own ability to write literary genres such as poetry, fiction, and literary nonfiction? Ph.D. program in Composition Studies is designed to provide a professional preparation for scholar-teachers who will engage in rigorous research and scholarship in Composition Studies. Although the intense writing experience in graduate school may enhance your ability to write in various academic genres, the Ph.D. Program is not intended as a preparation for future writers of literary genres. If you are interested in developing your ability to write in literary genres, UNH offers an excellent MFA program in Creative Writing. Can I pursue my Ph.D. degree in Composition Studies in absentia--i.e., without living in Durham or surrounding area? The answer is a definite no. As a matter of policy, UNH's doctoral program does not normally admit Ph.D. students without teaching assistantship because teaching preparation is one of the important aspects of professional preparation for doctoral students who will go on to teach at other institutions of higher education. Doctoral students who try to pursue their studies in absentia will also be deprived of the necessary support from the faculty and the graduate student community. How much work will it take to pursue a Ph.D. in Composition Studies? Being a Ph.D. student is like having a full-time job – sometimes it may feel like a job and a half. During the first two years, Ph.D. students are expected to enroll in two graduate (800- or 900-level) courses per semester while teaching one writing course. After the coursework is completed, students will prepare for the qualifying exam by developing a reading list that represents both the breadth and depth of their knowledge of theory and research in Composition Studies. During the final stage of the program, students will engage in dissertation research, which constitutes an original contribution to Composition Studies. In addition, Ph.D. students will be expected to develop their own research expertise within composition studies, to present their research at conferences, and to prepare manuscripts for publication. Students will also gain experience in administration by serving as assistant directors of various programs and by participating in departmental committees. Some students also work closely with faculty members as research or editorial assistants. Graduate students in our program develop a strong record of research and publication. Many of them have published journal articles and book chapters. They are also actively involved in local, regional and national professional organizations, presenting papers and workshops at such conferences as the Conference on College Composition and Communication (CCCC), National Council of Teachers of English (NCTE), American Association for Applied Linguistics (AAAL), Association Internationale de Linguistique Appliqee (AILA), Teachers of English to Speakers of Other Languages (TESOL), the North East Writing Center Association Conference (NEWCA), Northern New England TESOL (NNETESOL), Thomas Watson Conference, and the Symposium on Second Language Writing. Graduate students can find research opportunities in programs such as the First-Year Composition, Writing Across the Curriculum, and Robert J. Connors Writing Center. Opportunities for archival research is also available; UNH Library maintains the library of Richard S. Beal, which forms the core of the National Archives of Composition and Rhetoric. Our doctoral program provides multiple and ongoing opportunities for involvement in professional activities. UNH is the home of a well-established biennial conference on composition studies. Graduate students can also become involved in the Symposium on Second Language Writing, which is organized by one of the faculty members. In addition, the New Hampshire Literacy Institutes provides opportunities not only to take various courses during the summer but also to interact with faculty from other programs, departments, and institutions. UNH is also the home of the Richard Beal Collection, which forms the core of the National Archives of Composition and Rhetoric. The English Department offers some modest support for graduate students who are giving a paper or chairing a session at a professional conference in their field. Because these awards are made on a first-come, first-serve basis, you should make application as soon as you can in the academic year. To apply, write the Graduate Coordinator a letter requesting support; include the title of your paper (or session, if you are chairing a session), the conference and location at which it will be given, the dates of the conference, and an estimate of your anticipated expenses. The Graduate Coordinator will notify you in writing about the availability of support. The Graduate School also offers modest support for graduate students who are giving a paper or chairing a session at a professional conference. These awards can be combined with support from the English Department. Last year, awards were $200 per conference and were awarded on a first-come, first-serve basis. To apply, write to Harry Richards, Dean of the Graduate School, requesting support. Include the title of your paper, the conference and location at which it will be given, the dates of the conference, and an estimate of your anticipated expenses. Include an acknowledgment that you have received support from the English Department (if you have). The Graduate School will notify you in writing about the availability of support. It is a courtesy to the Graduate School to thank them after the conference for supporting your work. At present, the English Department and Graduate School do not offer financial support for attending professional conferences without giving a paper. Composition specialists are often asked by their departments to administer various writing programs -- such as first-year composition, basic writing, ESL writing, advanced writing, professional writing, writing across the curriculum and writing centers. For this reason, it is important for Ph.D.'s in composition studies to develop expertise in program administration. At UNH, some advanced doctoral students gain administrative experience by working for the Composition Program or by participating in departmental committees such as Composition Studies Committee. Others gain experience in organizing professional conferences such as the biennial UNH conference on composition studies and the Symposium on Second Language Writing. Our graduate program offers you the opportunity to explore the formal, historical, cultural, and theoretical dimensions of diverse forms of the written word. As a student in our program, you will develop a deeper understanding of canonical and innovative approaches to literature in English, including both such nationally-defined traditions as British and American literatures, and traditions organized around other principles, such as Postcolonial or African American literatures. Organized to reflect the changing profession of literary study--its history, its methodologies, and its production of new knowledge--the program includes the study of literature in cultural and historical contexts, the study of representations of identity, comparative approaches to literature, theoretical perspectives, gender studies, and cultural studies. The program offers you both broad-based and specialized courses on a variety of literary topics, and students may supplement their course of literary study with graduate offerings in related subjects and departments, including courses in composition, creative writing, languages and linguistics, history, and sociology, among others. Graduate students who come to study in our Department will find that we “cover” a great range of subjects in British and American literature, film, theory, linguistics, and composition and rhetoric. We don’t do everything, and we are stronger in some areas than in others, but we offer enough variety in our courses, and we are flexible and adventurous enough in accommodating thesis and dissertation topics, that our students almost always find the guidance they need in pursuing their intellectual interests. To help students see the shape of our Department, we have grouped professors below by their primary and some of their secondary fields. All of them are versatile to one degree or another, and many of them are affiliated with interdisciplinary programs. All the Americanist professors take part in the American Studies undergraduate minor and reflect their interdisiplinary interests in their graduate courses. Note: Professor Ramadanovic is our specialist in theory, but many of the other professors have a strong interest in theory, or in certain theories, and regularly assign theoretical readings in their graduate courses. Among the schools of theory actively explored by our professors are feminism of various kinds, New Historicism, post-colonial theory, ecocriticism, Marxism, queer theory, and cultural studies. Graduate students in literature are encouraged to consider these areas for their “elective” courses. Most Ph.D. candidates hold Teaching Assistantships throughout their programs, and the practical experience of teaching Freshman Composition is part of the candidate's preparation for a career in teaching. The course on teaching of composition (English 910) and the regular English 401 staff meetings supplement this experience, giving the teaching itself some theoretical underpinning and encouraging mutual reflection on teaching methods and problems. For those who want even stronger credentials in the teaching of composition, the seminar on teaching composition (English 917) allows students to do first-hand research. During the third and fourth years of the program, the candidate will typically do one or more apprenticeships in the teaching of literature. Instead of teaching English 401, the student will be assigned to teach one or two of the 500-level (sophomore level) literature courses and work with a faculty member in the department on developing all aspects of the course--planning the syllabus, leading discussions, lecturing, grading, etc. The English Department offers some modest support for graduate students who are giving a paper or chairing a session at a professional conference in their field. Because these awards are made on a first-come, first-serve basis, you should apply as soon as you can in the academic year. To apply, write the Graduate Coordinator a letter requesting support; include the title of your paper (or session, if you are chairing a session), the conference and location at which it will be given, the dates of the conference, and an estimate of your anticipated expenses. The Graduate Coordinator will notify you in writing about the availability of support. Fill out an application form here. Please include an acknowledgment that you have received support from the English Department (if you have). The Graduate School will notify you in writing about the availability of support. It is a courtesy to the Graduate School to thank them after the conference for supporting your work. At present, the English Department and Graduate School do not offer financial support for attending professional conferences without giving a paper or chairing a panel. Although the major work on the dissertation is concentrated in the last year or year and a half of the program, a good dissertation develops and gets refined over a longer period of time. The candidate should have a subject in mind as he or she selects fields for the Qualifying Examination. Then the fields can be chosen appropriately and the subject can grow as the student prepares for that exam. Once the student has passed the Qualifying Examination, a doctoral committee is appointed by the Dean of the Graduate School after nomination by the Department. This committee is normally composed of three professors from the English Department and two more from related departments. The student then prepares a written proposal outlining the dissertation topic, a minimum of ten pages long, the materials to be used, and pertinent scholarship related to the topic. The student has six months from the date of passing the Qualifying Examination to present this proposal. After submitting copies of this proposal to the doctoral committee, the student meets with its members to defend the proposal and to demonstrate his or her preparation to work on the project. The meeting should last one and one-half hours. The committee may opt to 1) approve the proposal, 2) require that the proposal be revised, 3) require that the student undertake further preparation before proceeding (the conditions are set by the committee and monitored by its chair). If the proposal needs to be re-presented, the student may take no more than an additional six months to do so. Doctoral candidates registering for English 999 are normally expected to attend a noncredit non-graded dissertation workshop directed by a member of the English Department's graduate faculty. This workshop will meet approximately once a month. (If travel presents a hardship, this requirement may be waived through a petition to the Graduate Director). In preparing the dissertation, the candidate should refer to the Graduate Catalogue for technical requirements. For dissertation format, the student must consult the graduate school pamphlet, Manual for the Preparation of Theses. After the dissertation is completed, the candidate will defend it orally at a formal examination with the doctoral committee. See a list of UNH Composition Ph.D. recipients with their dissertation topics and current employment. See a list of UNH Literature Ph.D. recipients with their dissertation topics and current employment.